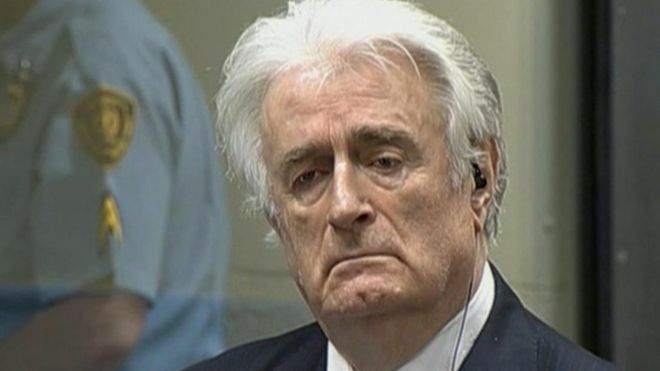 The Advisory Council for Bosnia and Herzegovina (ACBH) welcomes the decision of the International Criminal Tribunal for the former Yugoslavia (ICTY) in ruling that Radovan Karadzic, Bosnian Serb wartime leader committed genocide in Srebrenica against its non-Serb population and was also found guilty of five counts of crimes against humanity and four of war crimes, including taking UN peace keepers hostage, murder and the deportation of civilians. He was sentenced to 40 years in prison. "This is a historic moment for the people of Bosnia and Herzegovina and an important day for international justice. While this verdict it imperfect and will not bring back the innocent men, women and children who lost their lives in Radovan Karadzic's genocidal campaign, it does signal that those who commit crimes against humanity will stand before a court of law and will answer for the crimes they committed. ACBH is grateful to the United States, its military and all foreign governments, judges, attorneys, human rights activists and friends of Bosnia and Herzegovina who worked tirelessly for many years to not only capture Radovan Karadzic, but also ensure that he was brought to justice," stated ACBH President, Mirzeta Hadzikadic. Since Bosnia and Herzegovina declared its independence from the Socialist Federal Republic of Yugoslavia in 1992, it has faced some of the greatest challenges seen in Europe since World War II. The genocidal campaign that was carried out by Karadzic and others left over 100,000 dead, over 2 million displaced and over 20,000 Bosniak Muslim women and girls victims of sexual violence. The Serb forces, at the command of Radovan Karadzic, ethnically cleansed the overwhelming majority of the non-Serb population from what is now Republika Srpska - Bosnia and Herzegovina's smaller entity. He went to become the first President of the self proclaimed Republika Srpska and stood as the head of the Serb Democratic Party (SDS) and acted as the former Supreme Commander of the Bosnian Serb Army. Karadzic evaded capture for over a decade posing as Dr. Dragan Dabic, a new age expert in alternative medicine. He was finally arrested in 2008 in Belgrade, Serbia and transferred to the ICTY - a UN court of law dealing with war crimes that took place during the conflicts in the Balkans in the 1990's. The Dayton Peace Accords, which stopped the war of aggression against Bosnia and Herzegovina also legitimized and recognized the existence of Republika Srpska. As Professor Gerard Toal wrote in his book Bosnia Remade: Ethnic Cleansing and its Reversal, "Republika Srpska's territorial integrity was produced through violent ethnic cleansing, its political independence underwritten by subventions from Belgrade, and its economy built from accumulation by dispossession and criminal enterprise. The Bosnian government considered it a 'Nazi name' while chief American negotiator Richard Holbrooke saw it as a blood soaked name." ACBH has long fought for the people of Bosnia and Herzegovina and we welcome this legal victory. While justice is the only path towards peace and prosperity, ACBH is also reminded of the continuing struggle of Bosnia and Herzegovina's non-Serb returnee population and the culture of genocide denial that resonates across Republika Srpska. Last Sunday, in an act of defiance leading up to the verdict, Bosnian Serbs named a student dormitory in Pale after Radovan Karadzic. Pale served as the administrative headquarters of the Bosnian Serb Army during the 1992-1995 war of aggression against Bosnia and Herzegovina. Widespread genocide denial and such overt acts of propaganda only solidify an atmosphere of fear and hate among various ethnic groups and aim to keep Radovan Karadzic's dream alive. ACBH stands by the U.S. and EU policy of a united, multiethnic and democratic Bosnia and Herzegovina and strongly condemns any distortion of what happened in Bosnia and Herzegovina from 1992-1995. Instead of focusing on the glorification of war criminals, ACBH encourages leaders and citizens of Republika Srpska to promote peace, stability, democracy and the rule of law - all items that will enrich the lives of not only Serbs, but all people of the Southeast Europe region.